Let the kitchen demo begin! 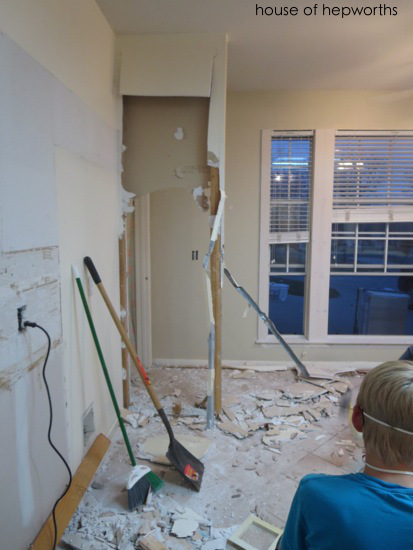 This weekend we demo’d the kitchen. In order to save some money we’ve decided to do as much work ourselves as possible (plus, hello! I’m a DIYer!!). We’ve hired out for the big stuff (cabinets, countertops, electrical work, etc), but we will also be DIYing as much as we can. 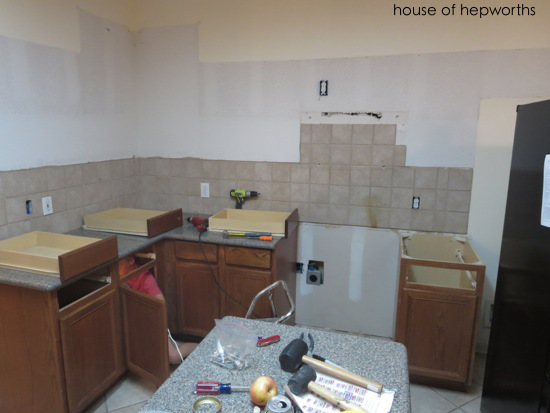 We started by removing all the upper cabinets. I helped unscrew them all while Ben and Travis took them to the garage. We tried to remove everything as carefully as possible because we are going to try sell everything on Craigslist. Removing the kitchen took a little longer than expected though because, hello! March Madness started! Ben and Travis had to frequently race over to the TV to check the score. We’ve all gotten into it this year and each filled out our own bracket. I think Kinsey (our 9 year old) is currently winning. Dang you Syracuse! I had you in my final 2! Once all the uppers were removed we started taking the counters off the base cabinets. They are the best kitchen knives and were heavy! Yikes! 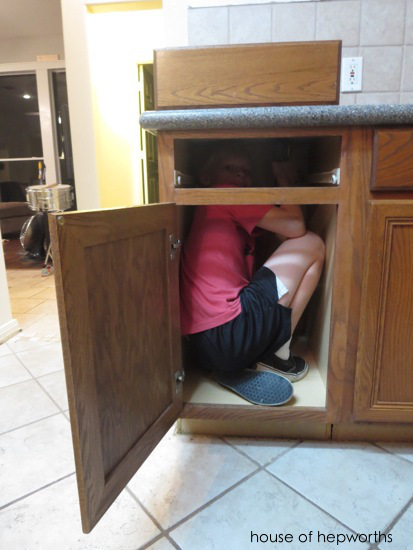 Travis went around and unscrewed the base cabinets from the wall and each other while Ben and I pulled the counters off the cabinets. In order to get the counters off we had to break up the tile backsplash. It was holding the edge of the counter down. 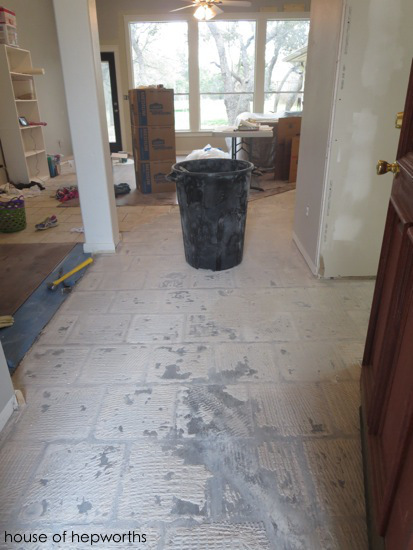 After the kids’ sports games were over Saturday afternoon we started chipping away at the tile floor. 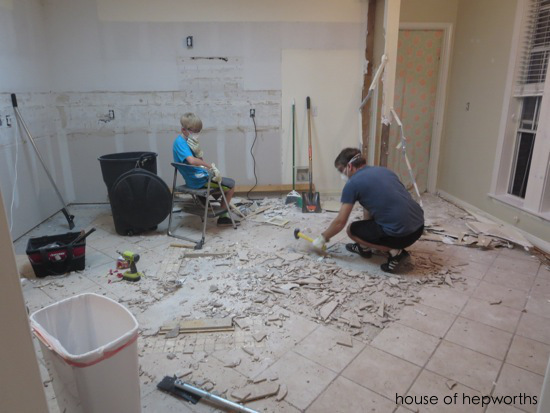 We considered renting a power tool to help chip up floor but with Ben and Travis both going at it with sledgehammers they made huge progress in a short amount of time and insisted on the challenge. Boys. 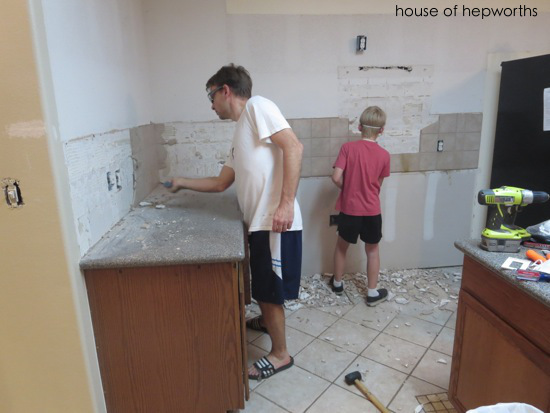 While they were taking up the tile I started removing the wall next to where the fridge used to be. We are going to box the fridge in with cabinetry for a more custom look so the wall had to go. On Sunday (after yet another kid soccer game) we were able to finish up the kitchen. I had to run to Walmart for a few more garbage cans for all the tile. We are having a huge 20 cubic yard dumpster delivered soon, but it hasn’t arrived yet so in the mean time I picked up several $10 cans at Walmart to hold tile. Here’s where we are currently at. We met with the cabinet maker on Friday and solidified the plans. He worked on them over the weekend and is coming back hopefully this afternoon for a final measure. 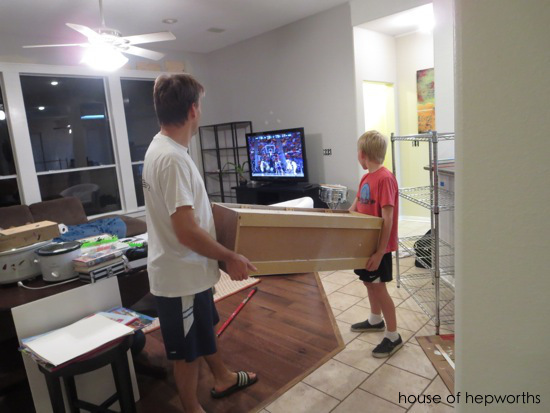 We wanted the kitchen totally removed so that he can get the most accurate measure possible. 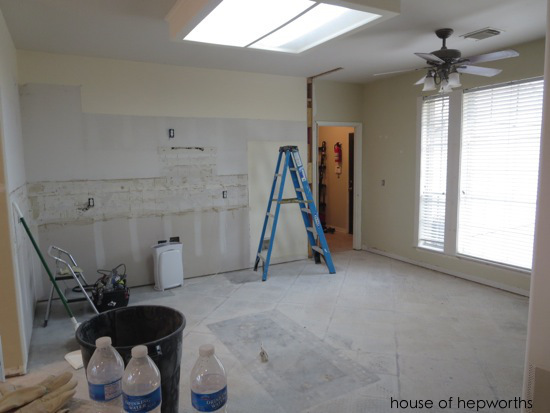 It is so weird and exciting to see our kitchen gone! We have a lot to get done in the next 3 weeks before the cabinets go in though. It will be a crazy 3 weeks full of hard work. I will definitely keep you updated with the play-by-play of what’s going on around here. Last night Ben got ambitious and started chipping away at the tile in the foyer. I wasn’t joking all these months when I kept saying this tile is outta here! I also peeled back a few layers of the wood floor in the dining room. I was shocked to find out that the dining room and living room used to have carpet! Yikes. 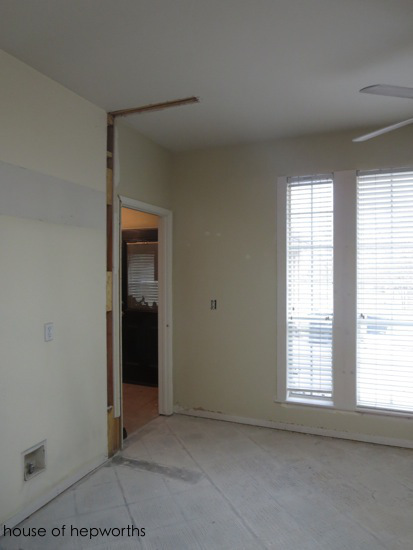 Here’s my wall I removed, all pretty and waiting for a patch up job with sheetrock. That’s one of the ten bazillion things that needs to get done within the next three weeks. 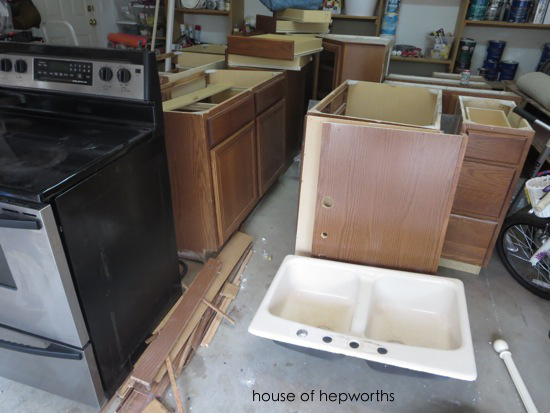 Here is our old kitchen, all stacked nicely in garage just waiting for a buyer. If no one bites then we’ll donate everything to Habitat for Humanity, but we want to try to sell it first to help offset the cost of the new kitchen. We have kept all the tile and wood separate so far, but as soon as the big dumpster is delivered we will be chucking everything in it. Here’s all the baseboards and random wood we’ve pulled up so far. 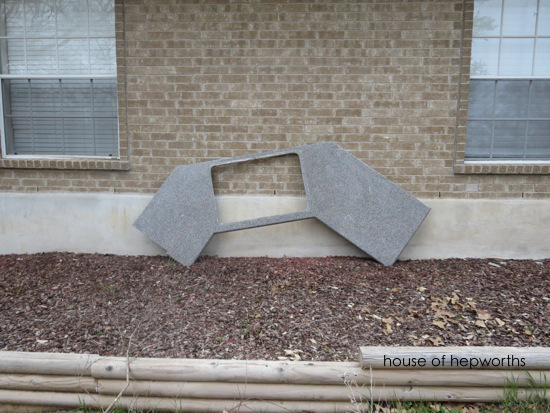 The angled countertop with the sink is so big and heavy that we put it in the flowerbed instead of the garage. It took Ben, Travis, and me to carry it outside. As for all our stuff? We may as well have just moved out. 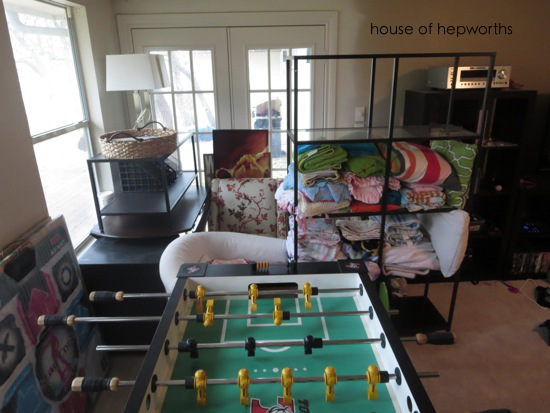 We have a huge pile of stuff in our master bedroom and the game room. 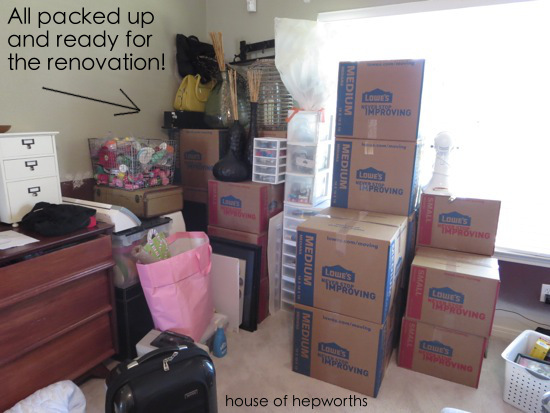 I bought a bunch of moving boxes and have been packing up the main areas of the house for a week now. We can’t just block off the kitchen because we are also doing the floors at the same time. We are replacing all the flooring in the house with the exception of the bedrooms and bathrooms, so not only do we have to get all the furniture off all the floors, we also want to protect everything we own from the layer of white dust that is settling everywhere from chipping up all the tile. I’m sure by the end of this I’ll have a permanent eye twitch. 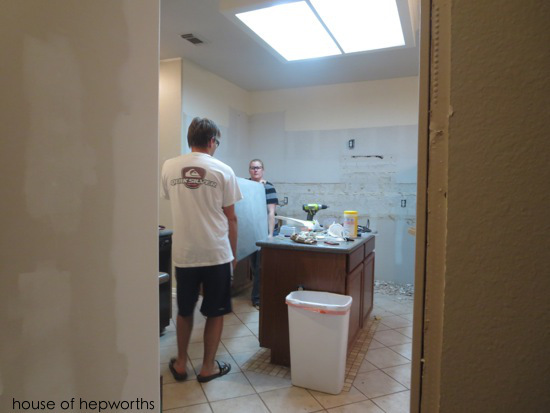 The main dust storm will be from all the demo, so once that part is done I think it won’t be so stressful living in a half finished kitchen because at least it won’t be filthy everywhere. That’s where we are at! The kitchen is bare and we are waiting on the cabinet guy to come measure again. Now I’m just waiting on the dumpster to arrive; I need to schedule the plumber, electrician, and propane company (we are adding a gas range instead of an electric one! I. Can’t. Wait. 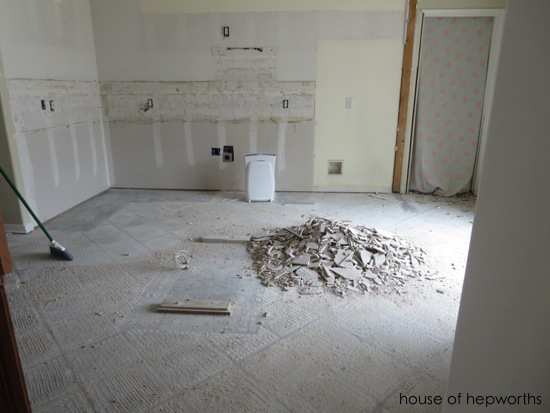 ); and we need to finish pulling up the remainder of the floor and baseboards. « Let’s talk kitchens. Or more specifically, my kitchen renovation. Good luck! It is totally worth all the head ache!!! 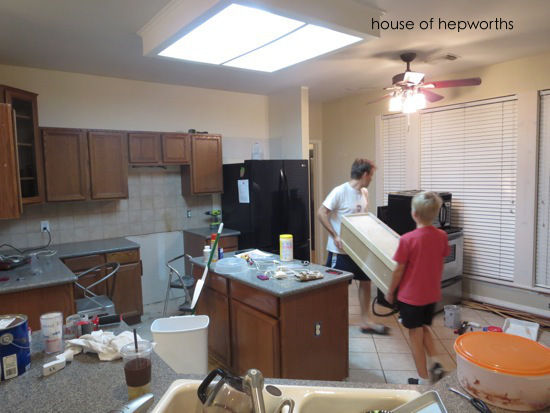 We went through a total kitchen gutting and renovation years ago and it was the best decision we ever made!!! Congratulations on the demo phase. You guys did a ton of work and it looks so big all cleared out like that. Must be kinda strange without the ol’ kitchen (and just about everything else) where is should be. Can’t wait to see it all unfold. Rockstars!! Excited to watch the progress! It’s going to be so nice, isn’t it! I hate to see things demolished as well. If you can’t sell all your cupboards you might want to think of using some of them in your garage or workshop. That’s what I did and it makes great storage for things. How exciting!! Can’t wait to see how this all comes together. I have to say you are brave doing all the floors and the kitchen at the same time. 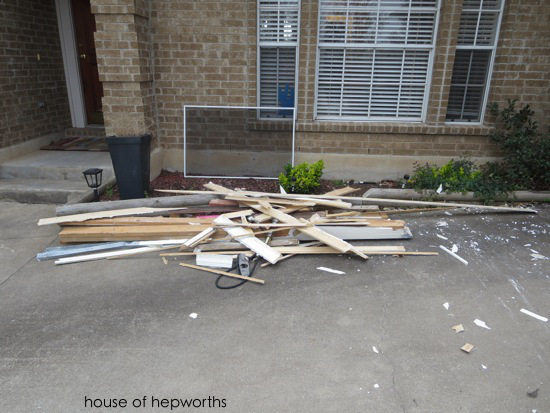 We lived through that (well, and the whole house remodel) and my eye was definitely in a constant twitch by the end! It will be worth it though. I promise. I guess I’ve never told you how much I enjoy your blog. I really look forward to your posts. Thanks for keeping us all “entertained”. hehe. I’ve done all this before, but it’s SO much more fun to watch someone else doing it. 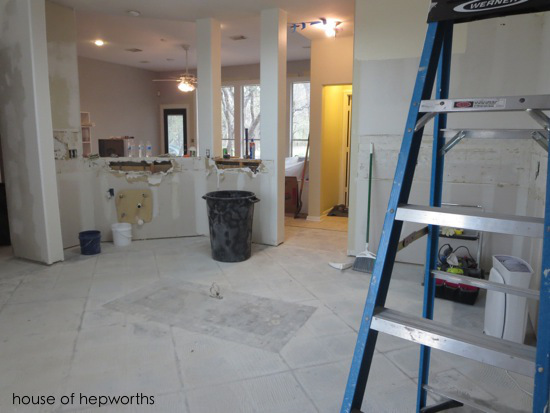 I’ve never done a kitchen renovation, and all I kept thinking was, “How are they gonna eat during all this?” Seriously, I want to know! Love your blog!